Hi Matt. Thanks for being with us! 1) Could you tell us how you came to be involved as a sculptor of pledge rewards for the Dark Angel Kickstarter? 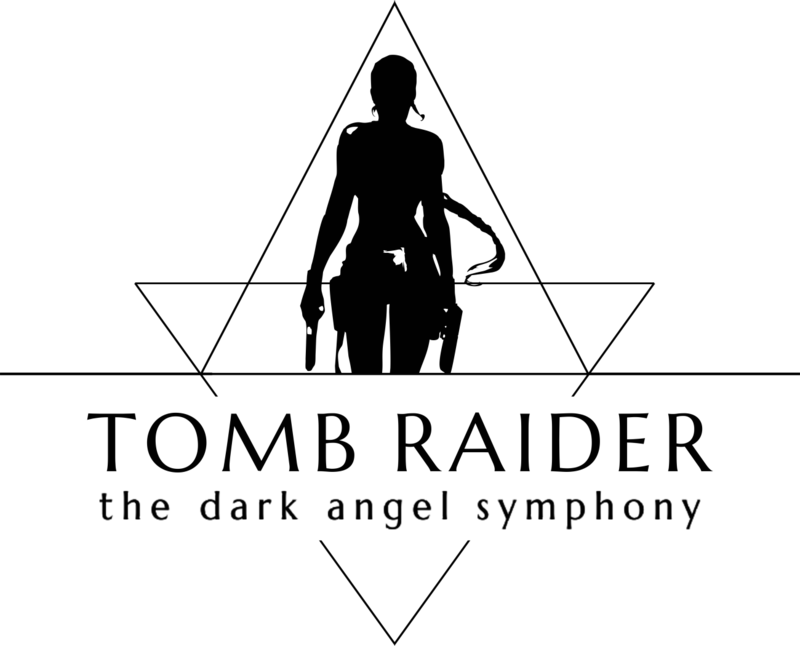 Well, it all really got started because my partner, Jenni, is a major Tomb Raider fan. Through her, I became friends with Murti Schofield. He’s also an artist/animator/sculptor, so that gave us a great connection and subject in common. He really liked my work with monsters and creature design, and asked a while back if I’d consider sculpting him a model of Kurtis Trent. He commissioned the model and it was good fun (although a BIG change from what I’m used to!) Much later, Ash (Kaprielov) happened to visit Murti and saw the Kurtis model, and was all “Hey! We need the guy who did this to do some stuff for us.” That was how I got properly involved in the Dark Angel project: Ash and Peter approached me together and asked if I’d be up for sculpting these statuettes. 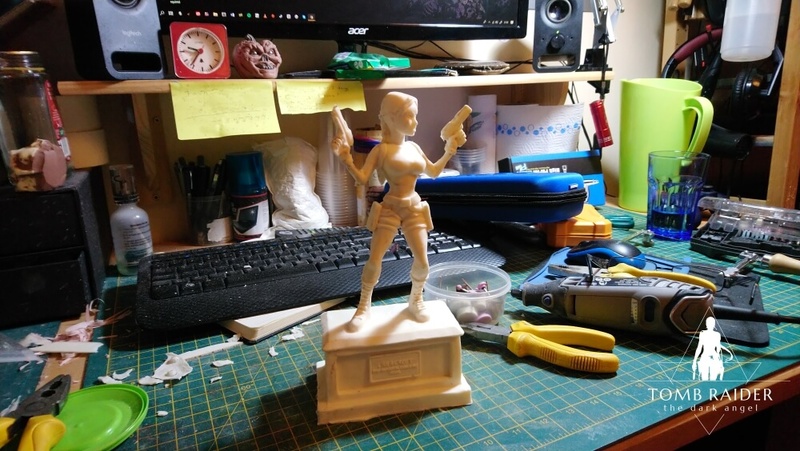 Originally, I was only going to do Lara’s memorial statue, but then Murti kindly gave us the base of the Kurtis model he’d commissioned from me to adapt and cast in limited numbers specifically for the project. That was so cool of him. 2) So, these Lara and Kurtis figurines are a bit of a change from your usual subject matter! What kinds of things do you normally focus on? Where do you get your inspiration? Originally, I started out in fine art, but that wasn’t really where I wanted to go. I’d always been a huge fan of monster films, sci-fi, fantasy… Grew up loving Ray Harryhausen’s Clash of the Titans, Jason and the Argonauts; the creature effects in John Carpenter films like The Thing, and of course the real biggies like Stan Winston’s work on Predator, The Terminator, and Aliens. I was mostly attracted to special make-up/prosthetic work and creature design: artists like Rob Bottin, Rick Baker, Phil Tippet, people like George Lucas and the Star Wars films in the 70s/80s, and alllll the way back to the real pioneers like Lon Chaney in silent movies like Phantom of the Opera. It amazed me how these guys could do such cool stuff on a shoestring budget. Whenever I got (and still get!) films I’m almost always more interested in the behind-the-scenes documentaries. All those cool little stories and tricks they used to achieve what you see on screen. I especially love horror/sci-fi/fantasy films from the 70s/80s; there’s just something special about practical effects. Don’t get me wrong: CGI is amazing and there’s some gorgeous stuff being done with it. But I like stuff you can actually touch and react to in front of you. I got going as an artist with 2D painting and caricatures, mostly in digital, but moved onto 3D sculpture a few years ago and am loving it. At the moment, time, space and money constraints mean I can only focus on small-scale things like busts, magnets, accessories and so on. But I’d love to move into larger-scale sculpts and, hopefully, prosthetics and special-effects makeup like the stuff I loved as a kid. 3) All of your sculptures are handmade from start to finish, without any 3D printing or computer software involved. How does that affect your sculpting process? Well, it probably takes a lot longer! 3D computer software is great (most of my experience is with Sculptris), but I love actually working with my hands. 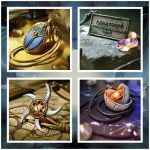 I tend to use polymer clay or an oil-based clay (e.g. Monster Clay). 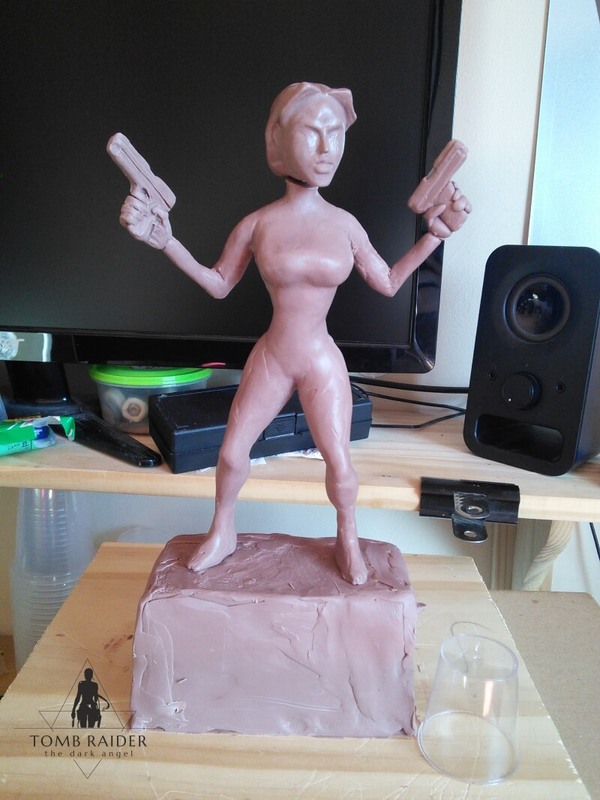 The biggest downside to sculpting Lara’s memorial statuette was that it happened to be slap-bang in the middle of a 3-month heatwave, so the oil-based clay was super soft and kept sagging! I always start with a wire armature that gets matched to the proportions of the figure in my references. Ash and the team showed me the Chronicles FMV and I got plenty of screenshots; that figure/model you see in the cutscene is a little awkward because she’s *not* human proportions but isn’t quite the true “heroic” (like a comic book character) either. So, I did the best I could from the screenshots and carefully bulked out the figure in clay, refining it at each stage. Every other day I’d send the team photos and a short video of the figure spinning through 360 degrees, so they could see the progress and offer feedback. The most useful feedback came from when we – Ash, Peter, and Murti – actually met up in person and they could hold the model in their hands, look at it from all angles etc. 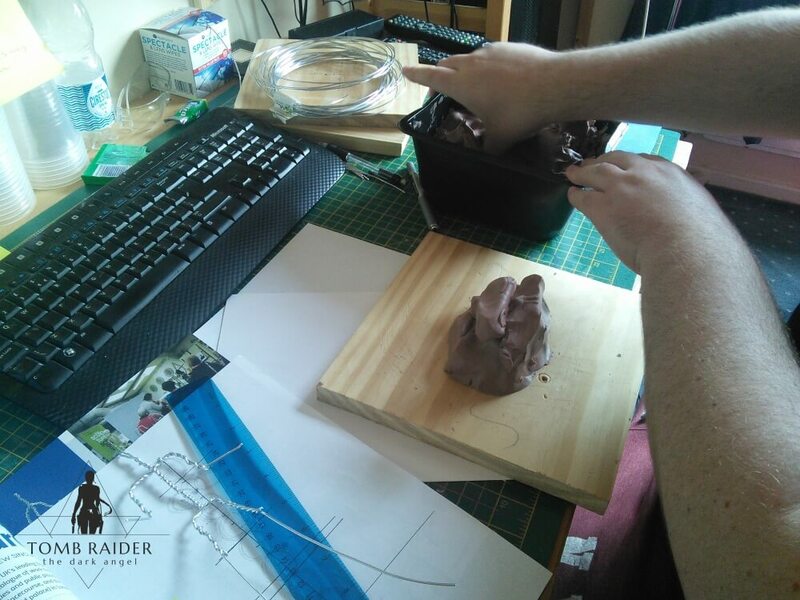 When Peter and the guys were happy, I’d move onto the next stage which was to make a silicone mold of the clay sculpt, then use the mold to cast a replica in resin. It’s quite a technical process and I was crossing my fingers the whole time, especially when I took the mold apart to see the first test cast! 4) What has been your biggest challenge so far? Definitely the casting process. 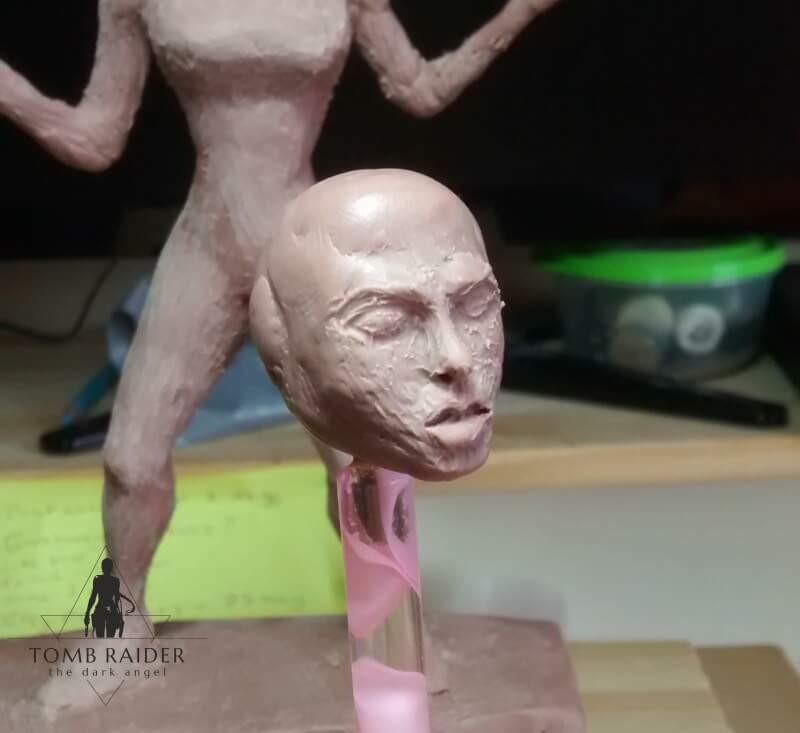 Kurtis has been a slightly different process to Lara’s because he started out as a polymer clay figure that was only intended as a one-off sculpt. He’s also a harder figure to cast because of the Chirugai and the angle it’s held at. Lara’s pose by comparison is quite flat, so she could get cast as a single piece. Kurtis needed a much more complicated mold/cast in several parts. Otherwise, it’s been a fairly similar process to sculpting monsters. 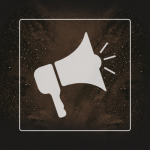 5) What is your personal connection to Tomb Raider? Most of my connection to the franchise comes second-hand through Jenni.  I’ve played the reboot games and enjoyed them but didn’t really click with the stories or Lara herself. I remember my uncle buying me and my brothers Tomb Raider III for Christmas one year; that would be in 1998 or 1999. That version of Lara had more oomph, but I remember that I couldn’t get past that bloody monkey in India who kept stealing my medipack. Maybe I should try again! You can follow Matt Chrich (and his monsters) on Twitter, Instagram, and via his Etsy shop 13thDimensionDesigns.